Versatility, portability, and maneuverability are just a few of the many reasons why a reciprocating saw should be found in every toolbox. These devices can cut through a variety of different materials making them viable in everything from framing, roofing, plumbing, and much more. While these machines aren’t overly complex there are a few things you should know when looking at the best reciprocating saw for you. In this guide, you will learn everything you need to know about how these machines work and what characteristics should be examined so you can be confident in picking a great model. Reciprocating Saw, Sawzall, or Sabre Saw? Often times these three names are all referring to the same thing and are often used interchangeably – with the term “Sawzall” referring to a specific brand of reciprocating saws. 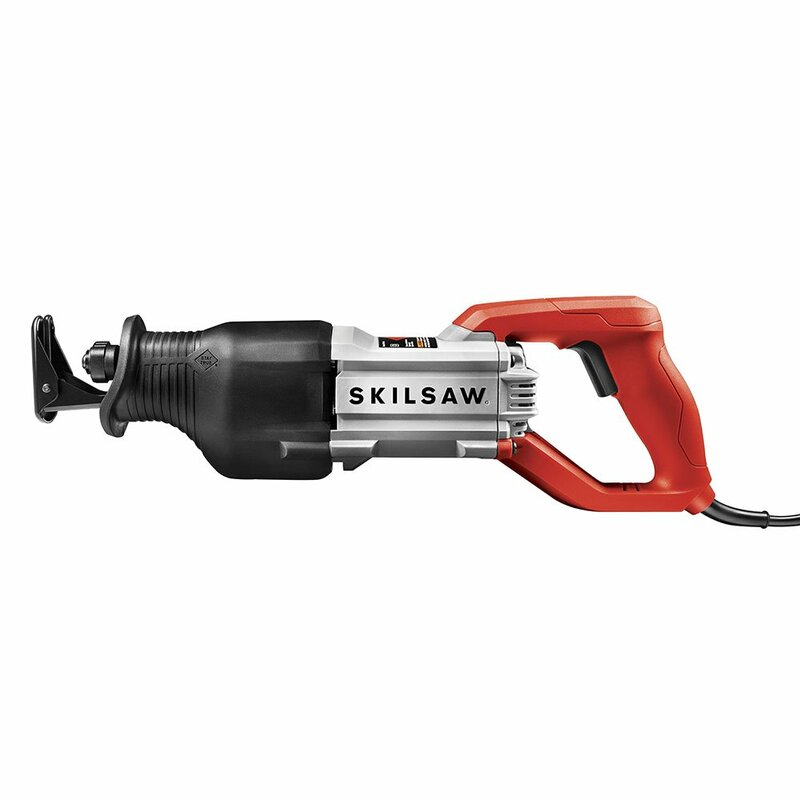 Sawzall is so strongly associated with reciprocating saws that they are often seen synonymous – much in the same way that Kleenex, despite being a brand, is often used to refer to all tissues. There are plenty of these machines on the market today and it can be a little overwhelming when picking one that is great for you. To get you started here is a cross-section of some of the better ones we have found – you’ll find a wide range of amperages, corded, and cordless models. Rip and tear through even the toughest wood with this Milwaukee machine! The extra high-powered motor can make the blade move upwards of 3,000 strokes per minute. The stroke amount can be manipulated with a small bit of pressure on the variable speed trigger. To be able to better control this device and reduce operator fatigue this machine comes outfitted with vibration reduction – this is made possible with a counter-weight located on the inside. To improve the lifespan there is the gear protection clutch – this device reduces wear and tear on this reciprocating saw’s internal components. Blades are easily replaceable too with the quick lock system – flip up the latch and pop the blade out, no tools required. While an amazing machine prolonged use can jam it. Thankfully Milwaukee stands by their product and sending it in for repair is fairly straightforward with their top-notch customer service. While not the cheapest model out there, this device is one of the better on the market because of its range of features and versatility. Stroke Length: 1 ⅛ in. This tough machine can take care of just about any job with its extra-rugged 13 amp motor. Control all that amperage with fine-tune precision via the variable speed trigger – giving you the ability to get great slicing even on more fragile materials. The Buzzkill technology is patented specifically by SKILSAW and has been shown to reduce vibration 35% better than the competition. The body of the machine itself is ergonomically designed for not only power and comfort but also realigns debris and dust away from the user. 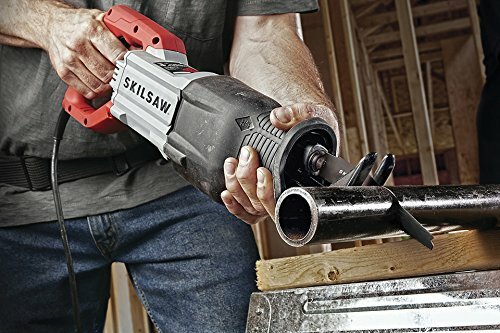 Capable of cutting through everything from wood, pipe, steel nails, trim, and more, this multifaceted machine shows why SKILSAW is often one of the first brands people think of when referring to residential saws. The device itself is a bit heavy but this is for good reason – made of the highest quality and toughest parts means that this machine is like a tank in reciprocating saw form. A great choice for those that want a saw that is built for power. One of the strongest machines on the market – this 15 AMP reciprocating saw can fling as high as 2,800 Strokes Per Minute. A considerable sum that is multiplied by the prodigious stroke length of 1 ¼”. 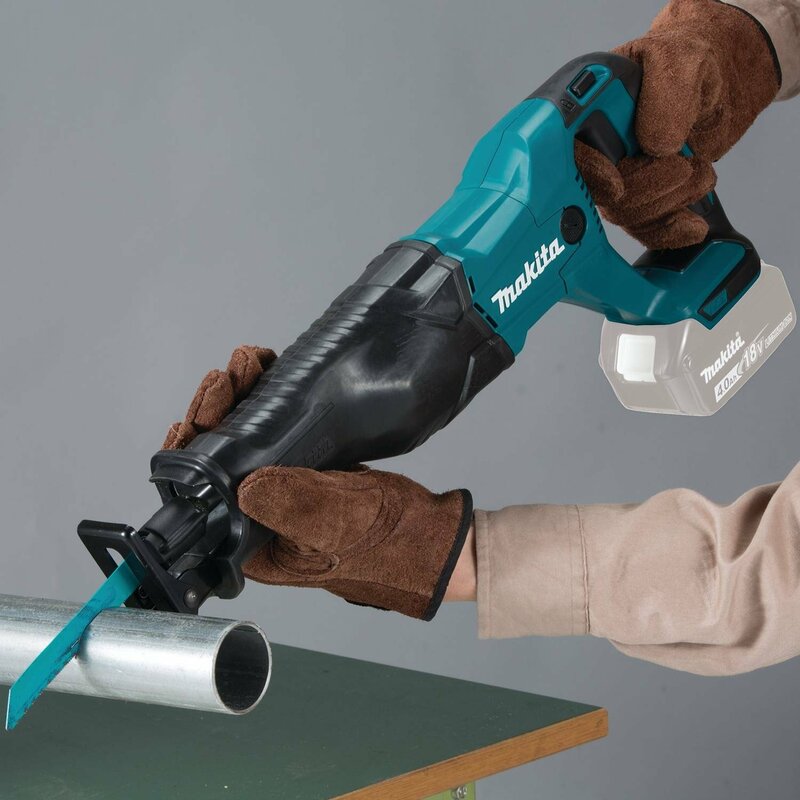 All this power won’t fry the machine either as Makita had the foresight to include a built-in-clutch to reduce gear damage by stopping the gears if the blade starts to bind up. This is an excellent upgrade on the earlier Makita jr3050t which only had an 11-amp motor. 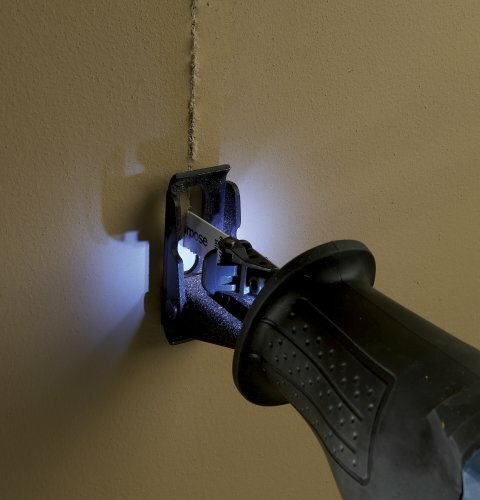 For better control on your part and less worry about messing up a spot that needs finesse, there is an electronic speed control that goes into effect when the blade meets resistance. The outside of the machine is outfitted with a rubberized grip for improved movement, while the trigger itself is an extra-large 2-finger sized one that locks in place. The price for this unit is steep but you get more than what you pay for. Overall this machine cuts faster and runs smoother than just about any other on the market and is perfect for those that want a reciprocating saw that will give them no hassle. Stroke Length: 1 ¼ in. 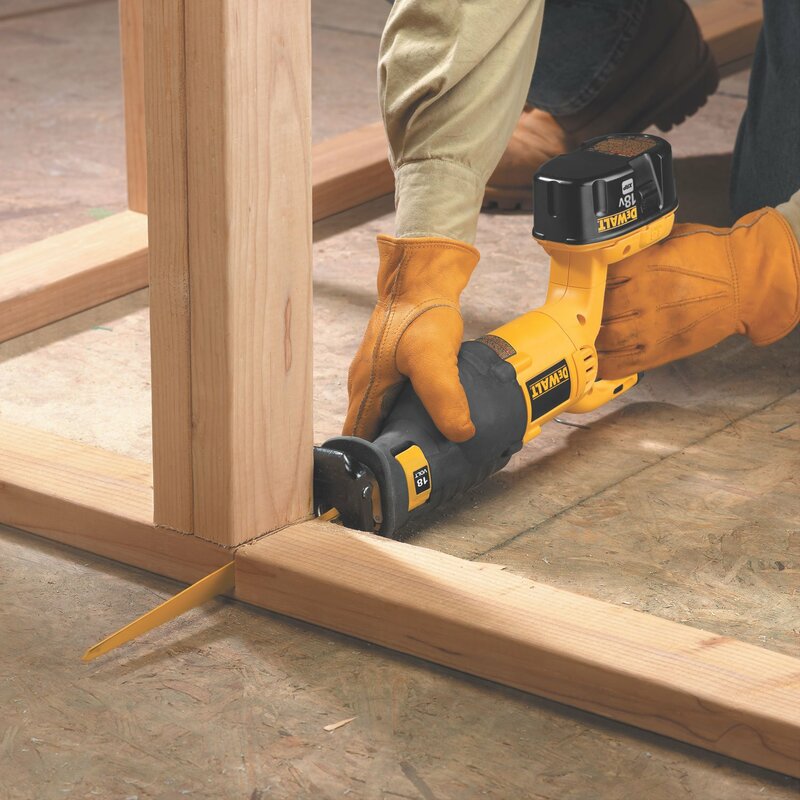 This DEWALT machine allows a high degree of different uses based on its 4-position blade clamp. Capable of even flush cutting, this 12 amp motor also has an impressive amount of slicing capabilities with its 2,900 SPM and 1 1/8-inch stroke length. The handle is jumbo-sized with a trigger that matches. In addition, there is the rubber material throughout that reduces vibration, fatigue, and gives superior gripping. The trigger is variable speed, giving the operator multiple cutting rates. When the blade is worn out merely use the keyless blade changes for toolless blade changes. This device can slice through both wood and most metals with little issue. Blade adjustment features are missing on this device, which can reduce the lifespan of the blades themselves. That being said, the ability to switch out blades is incredibly straightforward. This means that when you have to change them it will only take a short amount of time, allowing you to get back to work in a jiffy. Another great Bosch machine that comes with a specially designed handle to increase gripping capabilities and cut back on vibration. The variable speed control allows operators to break through iron, steel, aluminum, wood, branches, and much more. The feature that sets this machine out from other ones is the dual LED lights, which helps illuminate your cutting zone. Because of this, this machine is perfect for those that need to cut something far and tucked away in a dimly-lit area. Bosch added these lights without overlooking some of the other features that are more or less standard with reciprocating saws today. There is the ergonomically designed handle, variable speed trigger, and tool-less blade change system all included with this machine. The blades and case that come with this machine do leave a lot to be desired though – while not the worst they are of questionable quality. Blades and cases are relatively cheap and easy to come by though, so this shouldn’t be much of an issue. 96 Decibels noise operation makes it 10 Decibels louder than our number 1 pick. If you are looking for a saw that is capable of tackling most jobs with little trouble but still want to save a buck, then look no further than this SKILSAW reciprocating saw. 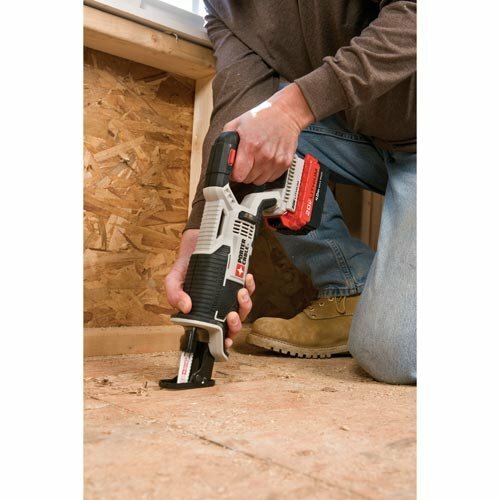 The 7.5 AMP motor is capable of tackling small projects around the house whether it be lumber, wood, and thin metal. This machine is great for beginners and homeowners as it has a tool-less blade change and counterbalance for vibration control. This vibration reduction improves maneuverability, gives stability when cutting, and help cut back on fatigue. The machine itself, while a great value, is of a markedly lower power level than many of its competitors. While this can be a bit of an issue with thicker pieces of wood and extra tough pieces of metal, when it comes to most projects in the residential area it is more than capable of doing it. In addition, but coming at only 8 pounds means that this device can be used for a long rate of time without the operator getting tired. 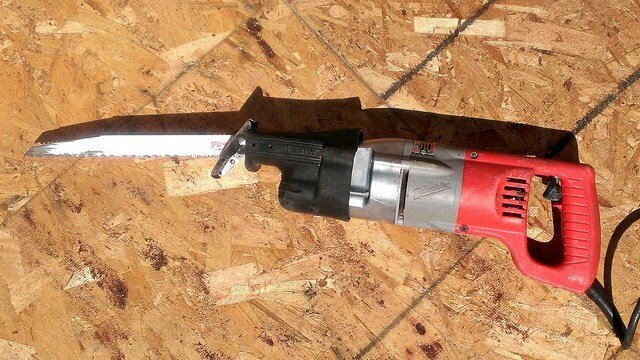 This cordless saw variant has the advantage of being completely maneuverable without the need for an extension cord. The blades themselves are also highly interchangeable via the keyless lever-action system – which allows blades to be switched out without the use of tools. The blade clamp can be adjusted to 4 different positions, letting operators perform flush cuts simply and concisely. The adjustable shoe provides more access to different parts of the blade and gives you more flexibility to do different cuts while maintaining visibility. This is all capable while maximizing comfort via the anti-slip rubber grips located on the inside and outside of the handle. This machine is capable of 3,000 strokes per minute, putting it on the upper end of reciprocating saws. Being a cordless device this machine has a set amount of time it can be used before stopping, which can be a bit of an issue with longer jobs. That being said, this is part of a family of products, making the battery backward compatible with other power tools. 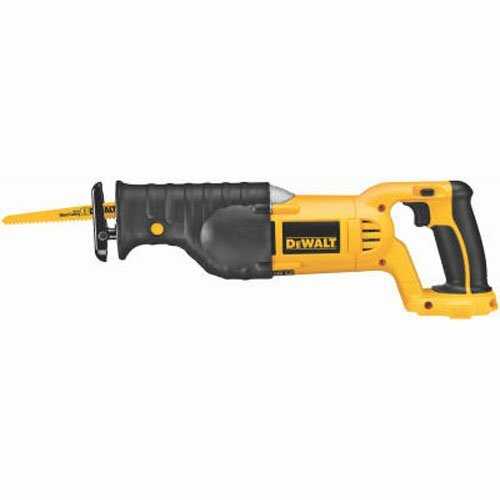 This means that if you own other DEWALT cordless products you can interchange their 18-volt batteries with this reciprocating saw. When it comes to cordless systems, this is the creme-de-la-creme model of recip saws! Power, speed, and versatility are all at your fingertips with this Makita machine. Despite being cordless this machine has a high stroke length along with 2,800 SPM, letting this Makita saw slice and dice through just about any material. 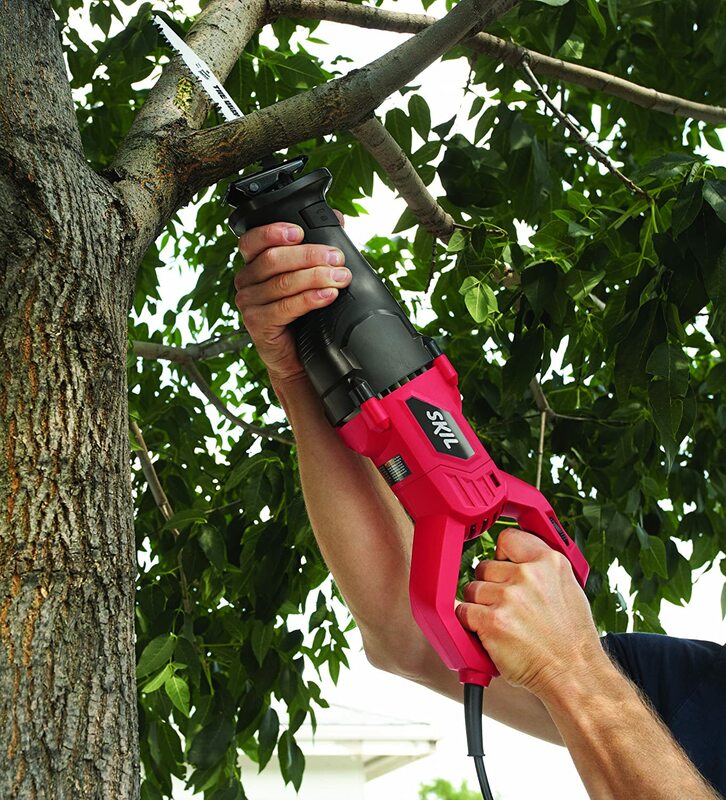 To further take advantage of this device cordless nature is its compact and lightweight design. Weighing in at less than 8 ½ pounds means that fatigue is a thing of the past. To help with cutting precision the handle and trigger are on the larger side while also coming endowed with a rubberized material for grip. 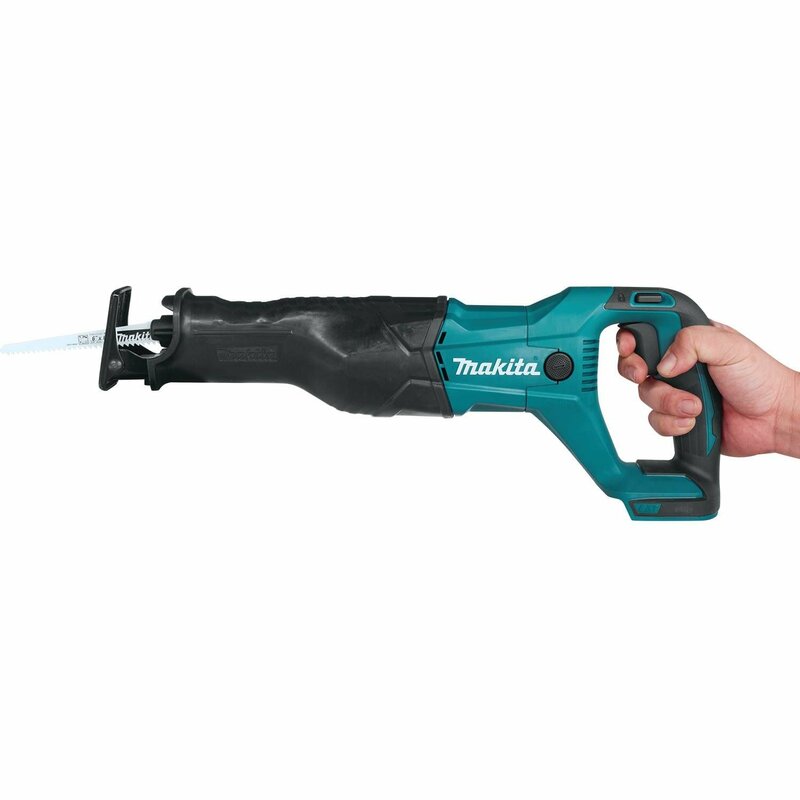 When it comes to cordless reciprocating saws, this Makita device is one of the most expensive – the power and toughness more than make up for this investment though! The Extreme Protection Technology (XPT) is targeted toward repealing the deleterious effects of water and dust that these type of saws often encounter. In our opinion this is one of the best reciprocating saws for its price as it stills contains a considerable amount of cutting strength. 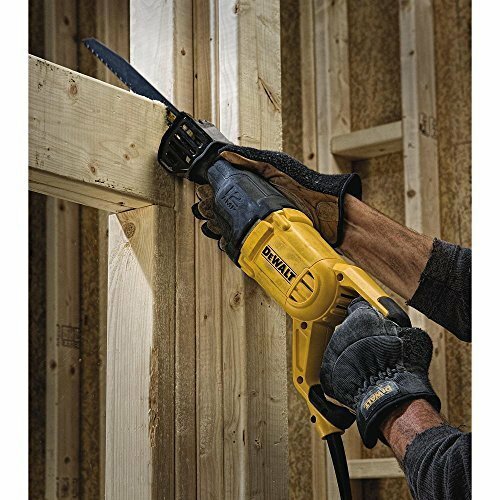 Using the unique PORTER-CABLE 20V Max System, this cordless wonder can accelerate upwards of 3,000 SPM giving it excellent cutting power against the likes of wood and most metals. The pivoting shoe helps you keep solid contact with the material you are cutting. The blade requires no tools to change and the variable speed trigger means you’ll be able to reload and customize your cut without any trouble. The machine itself is remarkably lightweight and small, making perfect for tight spaces. The lightness of this reciprocating saw isn’t just in weight but in the amount of duty, it is capable of as well. This means that considerable stress on this device can lead to premature death. While not great for professional use this is one of the better ones for homeowners as it has a low price and enough strength to tackle most smaller projects. I especially like to trimming the smaller branches around the yard. 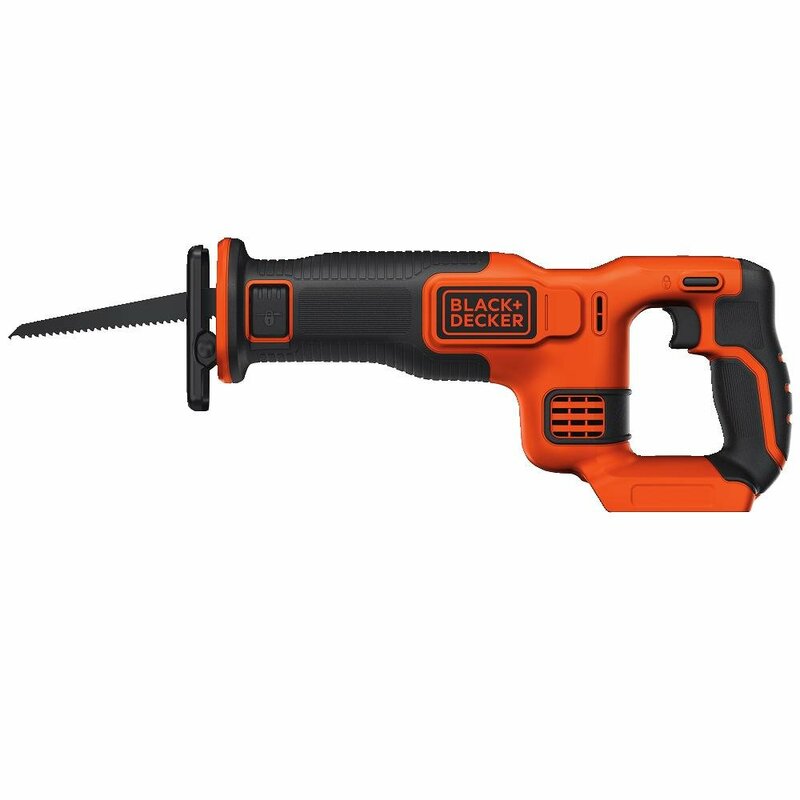 Black+Decker specializes in cordless power tools of all stripes that are simultaneously affordably priced while still being of high quality. Like most Black+Decker devices this machine has a nominal voltage of 18 but is actually overclocked to 20 volts in its initial use. This allows for improved cutting power right at the beginning of the charge – this is important as the beginning of the cut is often the toughest part. The manufacturer designed this machine small enough without compromising the handle and trigger. With the latter of these being pressure sensitive among multiple rates to better control the speed of the blade. 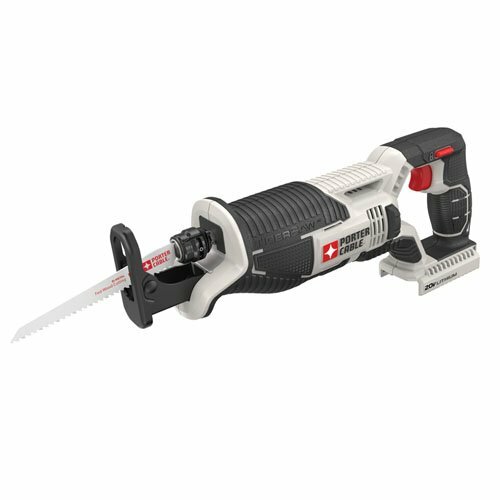 This cordless model has a double problem though – the stroke length is markedly inferior to the market average and the cordless nature means that this machine isn’t built for going the distance. The manufacturer has workarounds for that though – the voltage boost and backward capability with other Black+Decker 20V Max tools means that this device should be able to take care of most jobs around the home. This Ryobi cordless wonder is considered one of the better in terms of ease of use as it has multiple comforts built into the machine. For instance, the grip is coated in non-slip rubber, giving you an excellent hold in even moisture ridden conditions. Internally, the handle has anti-vibration material that helps absorb the shock of the machine’s motor. Surprisingly, this machine has one of the best strokes per minute despite being cordless – racking up to 3,100 SPM! Being part of a family of tools this Ryobi device is fully backward compatible with other Ryobi Lithium-Ion batteries. The safety switch is located on the side, which can be a bit confusing for new users of this device. Regardless, when it comes to a simple machine that is as portable as it is useful than this Ryobi reciprocating saw is more than capable. Amperage: What it is and Why it Matters. The amperage of a reciprocating saw is the amount of electrical current, measured in amperes, that is flowing through it at optimum power. An ampere is a unit of electrical current and is often shortened down to simply “amps“. As expected the higher the amps the more power a motor has. In terms of reciprocating saws, the range is typically anywhere from 7.5 to 15 and sometimes higher. Cordless models are typically rated by voltage rather than amps. In the past, these models were only rated as high as 12. Nowadays anywhere from 18 to 20v seems to be the standard. 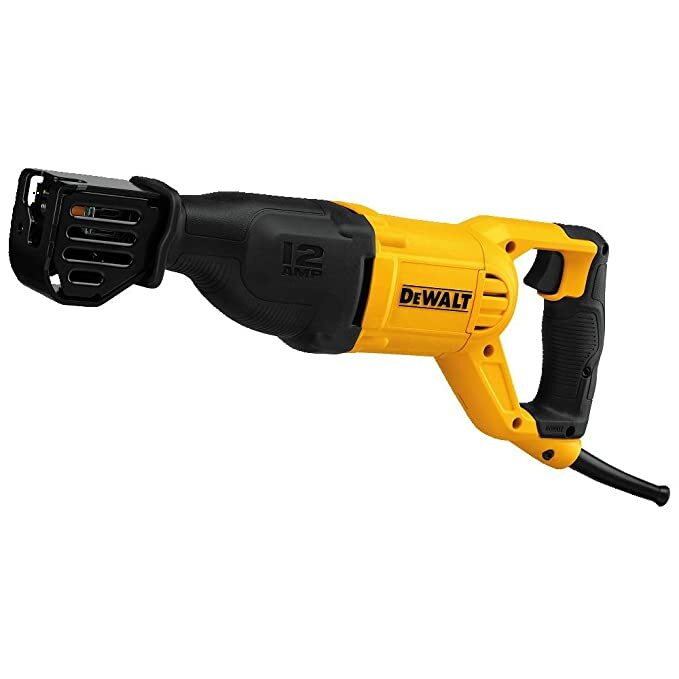 While it really depends on the manufacturer and other specifications of a machine, an 18v cordless motor is approximately the same power as a 12 amp corded reciprocating saw. How Many Amps Do You Need? 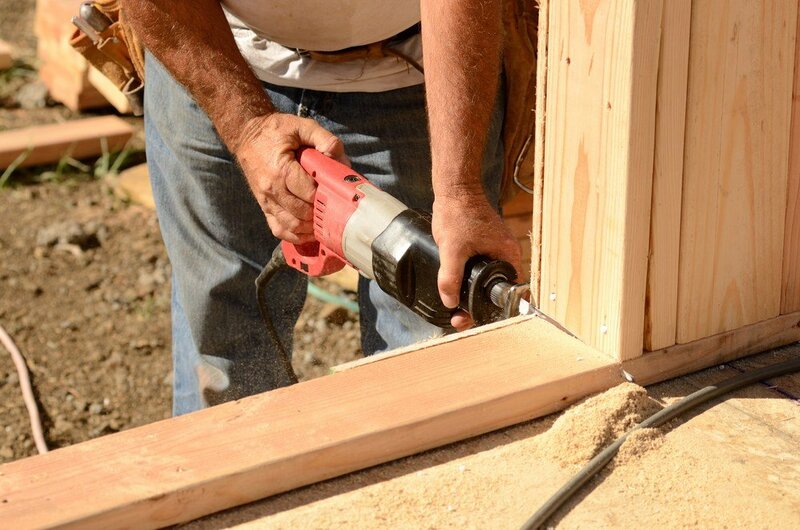 The amount that you need is determined by what type of work you expect to do with it – basic woodwork around the house such as trimming branches and cutting thin pieces of wood won’t need a lot of power. Construction sites often need to cut through nails, pipe, and thicker pieces of wood and will need something a bit higher. For those DIYers who want to do a lot 12 amps or higher is recommended. For someone who just wants a decent saw for occasional use than anything lower than 12 amps is fine. There are roughly two types of blade change mechanisms put into reciprocating saws today – those that require tools and those that are toolless. For the most part, toolless models have come the norm and are overall easier to use as it only requires the movement of a piece, typically a lever, to get an old blade out and a new blade in. Tooled models can still be found though and aren’t necessarily difficult to use – in fact, all that is often needed is a screwdriver or Allen wrench to unhook the blade and reattach a new one. The best way to fix a broken reciprocating saw is to prevent it in the first place – that’s why proper maintenance and use procedures should be followed. When using one of these machines always make sure to use the correct blade – what you use to cut wood and pipe can often be much different. Using the wrong blade can lead to not only breaking of the blade but destruction of the complex gears inside. When attaching the blade make sure it is firmly secure – toolless mechanism just require the lever to be snapped properly in place, while tooled mechanism require that you tighten the screw snuggly. If at any time you find that the blade itself isn’t reciprocating properly or that you lack power, first check that the power source is consistent. For corded products, this means to see if the extension cord isn’t frayed or broken anywhere and that the extension cord isn’t too long. With batteries, this means to check for any breaks in the housing. If you still have issues that it is possible one of the teeth on the gears inside might be broken which typically requires a call to the manufacturer to get the associated part. While these tools are rugged, avoiding dropping them will help tremendously with their lifespan. Auto-Stop Brushes - What are They? 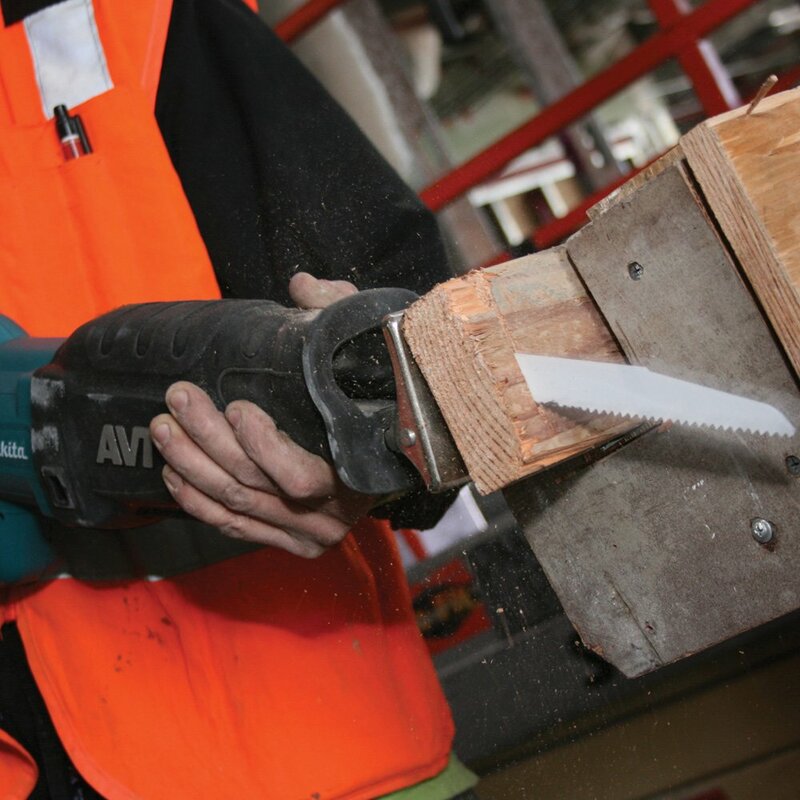 While reciprocating saws are of course saws first, they can become a more versatile tool with the right attachments. Scrapers, rasps, scouring pads, and brushes can all be integrated into these tools. The brushes are especially useful as they allow for a high powered scrubbing all the while saving your back and shoulders of most of the strain. This attachment is inserted via the blade holding mechanism. The strength of the reciprocating saw mixed with a brush can blast away paint, rust, and grime from just about any surface. Advantages of Rotating Blade and Handle. To fully take advantage of the reciprocating saws primary ability – that is to cut at angles and locations impossible when compared to other types of saws – than get one with a rotating blade and handle. Being able to rotate the handle and blade allows operators to cut awkward spots in a more comfortable way and with more power. 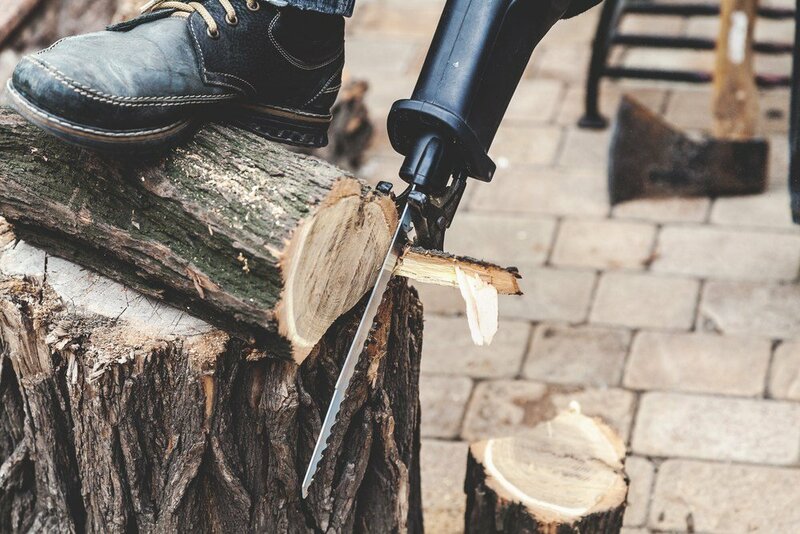 For instance, cuts that need to be started on the bottom of a piece of wood but are located at eye level or higher is much easier when the teeth side of the blade is aimed upward – a feat only possible with a rotating blade. When looking at these machines the most important factors are amps, stroke length, strokes per minute, and the anti-vibration features. While all the products outlined here would be a great choice for just about all levels of use, the one that shines the most is the Milwaukee Sawzall . While it has slightly fewer gimmicks and features, it brings a robust construction and all-day power that is rarely matched in the industry.